Mumbai got a new landmark on 30 June 2009, inaugurated by Congress President and UPA Chairperson Sonia Gandhi. Much later it was named Rajiv Gandhi Sea Link, a project that claims to be ‘one of the most highly recommended project of all the transport studies done for the metropolitan region.’ The Sea link has come to be a glamorous substitute for the Mahim Causeway, which was the only link connecting the western suburbs with the island city of Mumbai. In a recent poll conducted by the Mumbai Mirror to list seven architectural wonders of the city, the Bandra Worli Sea-Link, as it is popularly called, topped the list. The some others in the list were the Gateway of India, Mount Mary Church, Gorai Vipassana Pagoda. These were monuments were chosen over places like Dhobi Ghat, Mani Bhavan, the Seven headed Shiva, Sewree fort which also contested for ‘wonder’ status. The Banganga, Docks, the Muhamad Ali Road, Chor Bazaar, Bhuleshwer, Carter Road promenade-all brimming with the various characteristics which comprise the essence of the city, were perhaps enough uncanny to be not considered for the poll. What would be the parameters to decide a monument or an ‘architectural wonder’ in this context? Is it the symbolic importance? If symbolic in terms of history, then what is the history of the city we choose to look at? When the general mass cannot identify a prominent misquote during the polls-to call the Caves of Mahakali and Jogeshwari ‘tunnels’ of Mumbai. However, this is not a deference to the idea that the Sea link is a structure of merit. The success of the Sea-Link is being discussed perhaps on the following parameters- It is among the most complex & advanced construction projects ever in India, a major project in Mumbai metropolitan region after Mumbai-Pune expressway, the Sea Link reduces travel time between Bandra and Worli from 45–60 minutes to 7 minutes; also the single tower supported 500 metre long cable-stayed bridge at Bandra Channel and twin tower supported 350 m cable-stayed bridge at Worli Channel for each carriageway and also an intelligent bridge system which will provide additional traffic information, surveillance, monitoring and control systems. Last but not the least; it will be the new landmark for Mumbai, a power symbol of immense pride for the nation’s economic capital. Mumbai’s new monument which every Mumbaikar is taking a great collective pride in, irrespective whether they are entitled to use it or not. Such symbols of technological progress are thus transcending from their primary functions and begin to form our new monuments as a part of nation building. 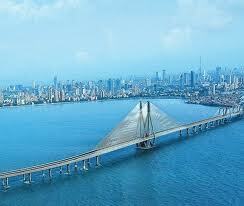 Mumbai postcards have already begun replacing the Gateway with the Sea-Link.